Lorraine Brock is surrounded by her family and loved ones. Judge James Shriver is at right. Lorraine Brock smiles as she looks at a family picture given to her by Judge Shriver. BATAVIA, Ohio – Thursday, July 12, was a big day for Lorraine Brock. And a happy day for her and her five children. 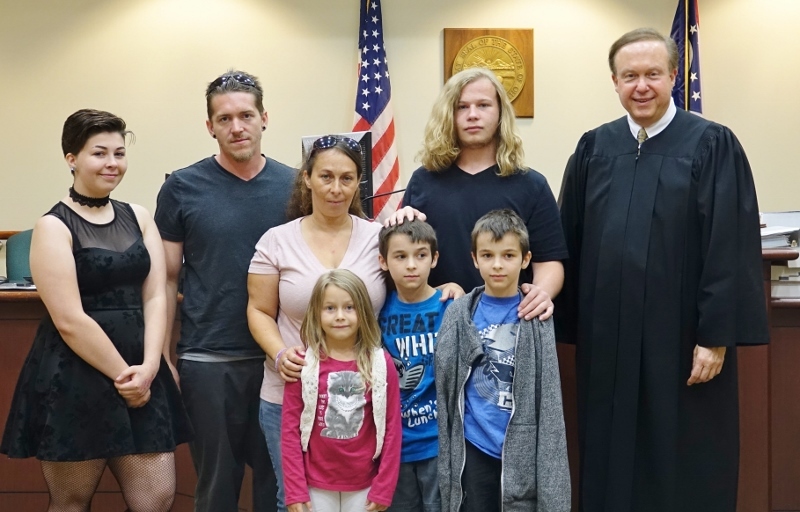 Lorraine graduated from Judge James Shriver’s Family Dependency Treatment Court and all her children were there to celebrate the occasion. Clermont County’s Children’s Protective Services removed Lorraine’s children from her custody in August 2016. “I lost track of what was important. We were homeless. I was using. I had active warrants in three different counties,” Lorraine recounted to Judge Shriver and those at the graduation. Her children were put in foster care, but even then Lorraine did not stop using. “I started missing supervised visits (with her kids),” she said. It was only a matter of time, she learned, before she would lose custody of her children entirely. “I didn’t walk away this time,” she said. At that point, Lorraine was ready to accept help, enter treatment, and start to piece her life back together. She wanted to regain custody of her children, and that’s where the Family Dependency Treatment Court comes in. The court, which began in 2014, works to reunite families, as parents complete a rigorous program. The program requires weekly appearances before Judge Shriver, as well as frequent drug screens. Parents must submit weekly letters detailing their activities, which comprise a journal that is returned to the parents when they graduate. They must attend AA or similar meetings. They receive treatment. They must have a job and secure stable housing. Lorraine began the court program in May of 2017. She lived for four months at the Adams Recovery Center. “It was a safe environment, a loving environment. Then I came out into the real world, and realized ‘wow,’ I don’t know what I am doing.” Counselors and recovery coaches at the Clermont Recovery Center offered crucial support for her during this time – and continue to do so, she said. 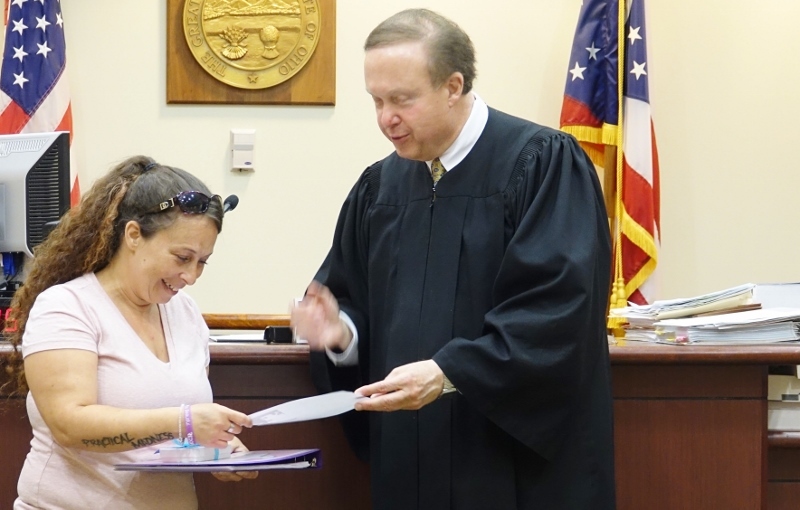 Lorraine’s path has not been easy, Judge Shriver said, as he commended her for her hard work to maintain her sobriety, keep a job, and reunite with her children. “Recovery is like growing up,” Lorraine said. “I left life at 12 years old, and I picked it back up at 36.